Five Seattle chefs at the top of their game. Between them, they have 19 James Beard award nominations, 16 restaurants, and countless rave reviews from some of the nation’s toughest critics… And oh, they all happen to be women. These five chefs are part of a growing number of women changing the culinary landscape and man, are we lucky to have them here in Seattle. This is the last installment of a five-part blog series about the worlds of Chefs Maria Hines, Monica Dimas, Rachel Yang, Shannon Martincic, and Renee Erickson. Chef Renee Erickson can do no wrong. Everything she does — from what she puts on the plate to what she hangs on the walls — is perfect. And this isn’t an idle exaggeration for the sake of a snappy blog intro. I really believe it. I’m not the only person in Seattle (or in the country, for that matter) infatuated with Chef Erickson. Bon Appetit ran an article devoted entirely to her amazingness in 2016: “Erickson has single-handedly made her hometown one of the most exciting places to eat in the country,” writes BA critic Andrew Knowlton. Yep. And after a third consecutive nomination, Chef Erickson finally received the James Beard award for Best Chef Northwest last year. She’s also been raking in glowing reviews for her recently-opened steakhouse, Bateau, including a first-ever four-star review from Seattle Times‘ critic Providence Cicero. To make this even more impressive, Chef Erickson has not just one or two incredible eateries — she has SIX. Plus, a farm. Her family of projects is called Sea Creatures, which is a fitting name for two reasons. One, most of her restaurants celebrate Seattle’s fresh-from-the-ocean bounty. Two, all her spots are imbued with her impeccable, immediately recognizable style: bright, chic, and breezily nautical. Notably, there’s not a mediocre establishment in the bunch. I’ve made a point of visiting all of Chef Erickson’s restaurants, from The Whale Wins (a lovely seafood-focused restaurant in Fremont that shares a space with Chef Rachel Yang’s Joule) to Bar Melusine (a French Atlantic-inspired seafood bar) and Bateau (a steakhouse like no other serving cuts from Chef Erickson’s Whidbey Island farm). But here, I’m going to focus on one longtime favorite and one new discovery. In 2016, Chef Erickson opened a trio of eateries next to each other in Seattle’s Capitol Hill neighborhood. While two (Bar Melusine and Bateau) are classic sit-down establishments, the third is an unexpected twist. General Porpoise is a doughnut shop. 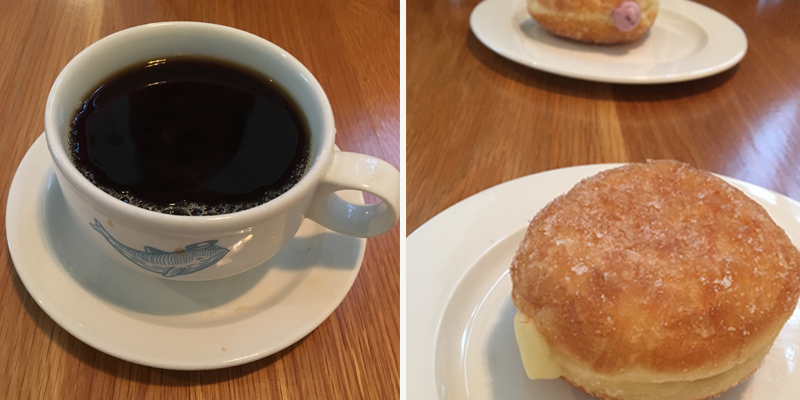 A fancy doughnut shop at that, serving a carefully curated coffee selection and sparkling wine… because, why not? 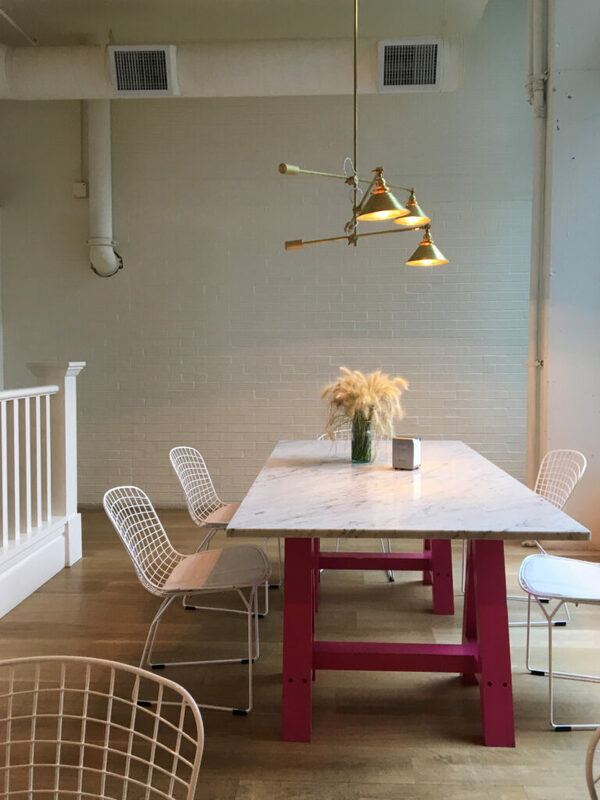 The space is swoon-worthy. 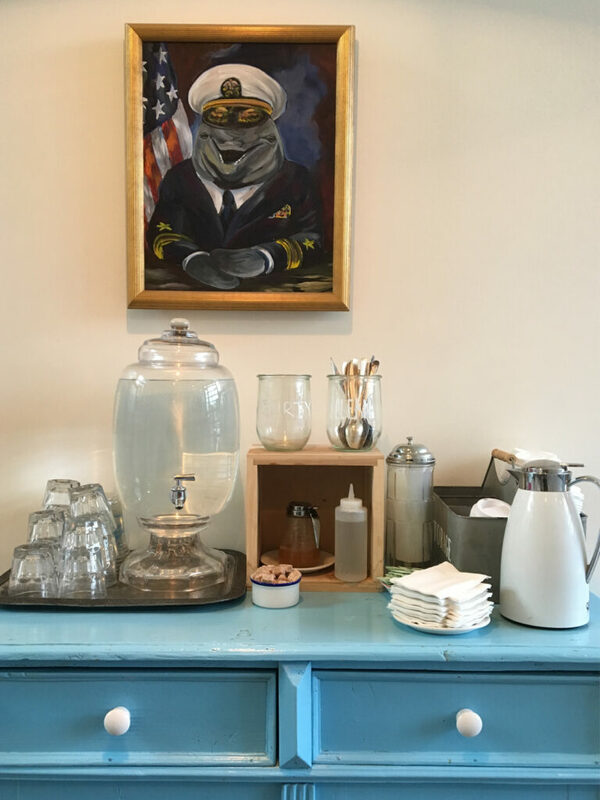 A tiny little shop, General Porpoise’s design is spot-on: it’s quirky, chic and modern with delightful touches like a magenta La Marzocco espresso machine and a portrait of General Porpoise himself. A major reason for my obsession with Chef Erickson is the thoughtful, gorgeous interiors of her restaurants. And General Porpoise is no exception. 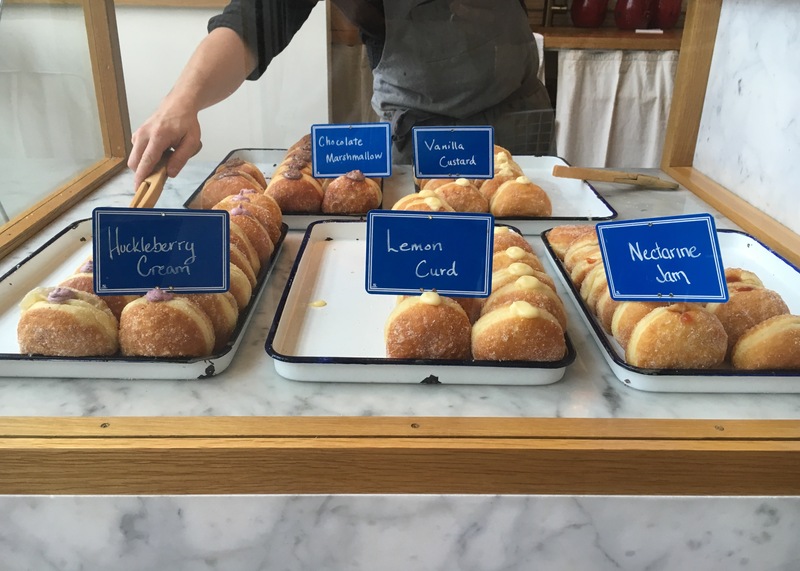 General Porpoise’s doughnuts are unique: they’re the yeast variety, so they’re light and and fluffy, and filled with delicious seasonal creams and jams. There are a few flavors usually available: chocolate marshmallow, vanilla custard and lemon curd. On this trip, I went with my favorite, lemon curd, and my boyfriend snagged a seasonal huckleberry custard. The doughnuts aren’t the only good thing at General Porpoise. The coffee is also amazing. I was especially excited to try it because I heard their coffee beans were selected based on a blind cupping. The result is that General Porpoise carries beans from a variety of roasters, including two I’ve visited in my travels: Toby’s Estate in Brooklyn and Heart in Portland. Interestingly, the coffee menu at General Porpoise is split into two categories: Coffee Fast and Coffee Slow. “Fast” is a cup of their batch-brewed coffee of the day and “Slow” is a cup specially brewed for you via Modbar. Either way, you’re in for a treat—especially if you’re a coffee snob like me. And with that, I had discovered a new little neighborhood gem to brighten my mornings with good doughnuts and equally good coffee. This small, dreamy restaurant is where my love for Chef Erickson began. It all started on a sunny summer evening in 2015, when I visited The Walrus and the Carpenter for the first time. Since that meal, it’s been my favorite restaurant in Seattle—and my #1 “can’t-miss” spot for visitors. Here’s why. First of all, The Walrus and the Carpenter is located in one of my favorite Seattle neighborhoods: Ballard. An area rich with maritime history, Ballard is the perfect place for Chef Erickson’s seafood-focused menus and nautical style. Fittingly, the restaurant is housed in an old brick building formerly home to “Kolstrand Mfg. Co. / Marine Hardware.” This evening, I walked in past Chef Ethan Stowell‘s two restaurants (Staple & Fancy and Marine Hardware) to the very back of the building, where Walrus and its sister bar, Barnacle, hid from view. A word to the wise: there’s almost always a wait at this teeny, super-popular eatery. So be ready to settle in (as I did) at Barnacle and enjoy a cocktail while you wait. 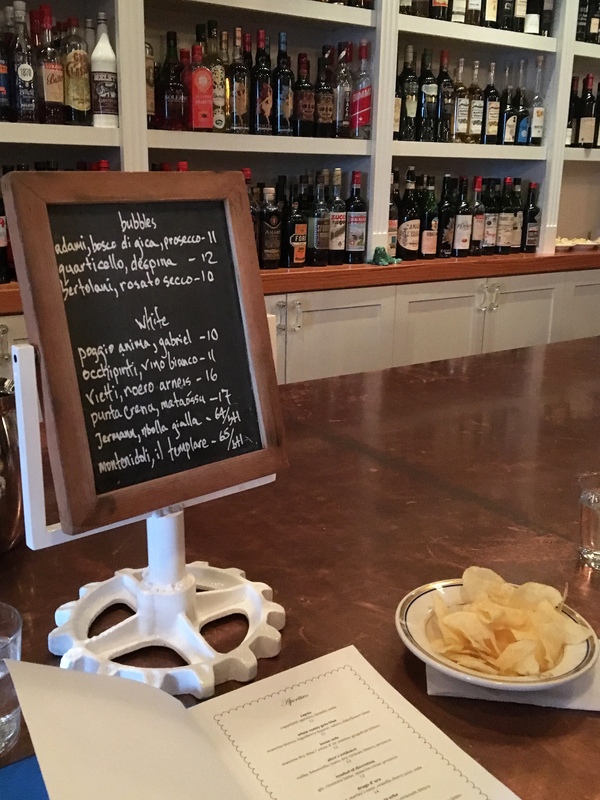 A love letter to Italian aperitivo, Barnacle’s specialty is bitter cocktails (like an Aperol Spritz or a Negroni) and light snacks. And by light snacks, I mean Lay’s potato chips. I’m not kidding — your perfectly crafted Italian cocktail is served with this all-American snack. Just check out the family-size bags stored above the bar! As we walked into Walrus after our aperitivo, I remembered why it enchanted me that very first time. The space is small, but feels bright and warm. The white walls and exposed beams are reminiscent of a sun-faded cottage on the beach; an escape into fresh air and bright days. On your left, you’ll glimpse baskets of fresh oysters ready for the evening’s shucking. And to the right, a sweet little patio perfect for the warm summer nights. That’s where we settled in this time. The concept here, as at most Chef Erickson restaurants, is that you order small plates to share. Our server recommended 4-5 plates for two people, but I’m usually very content with 3 plates plus some oysters to start. And oh, the oysters! 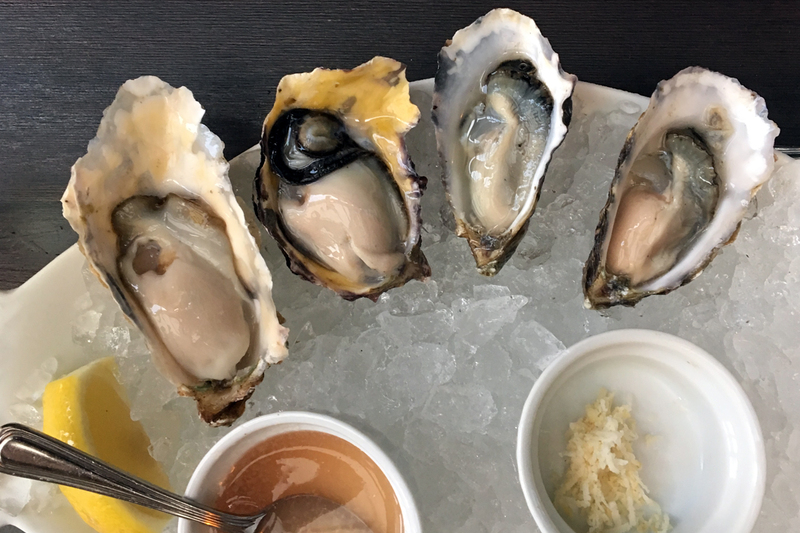 Walrus is known for its rotating selection of daily oysters, plucked from Puget Sound. If you’re visiting Seattle, you really do have to try at least one or two here, even if you’re not a bivalve-lover. Another Walrus highlight is the bread: it’s delicious. It’s made by two brothers (Sea Wolf Bakers) who started out by baking their bread in cast iron skillets in borrowed kitchens at night. 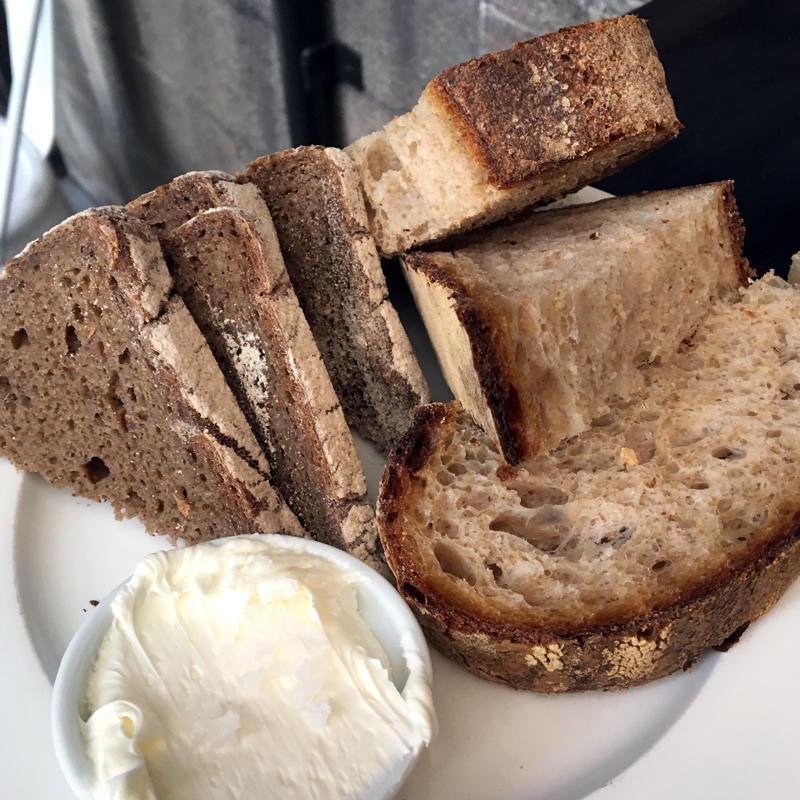 Chef Erickson has been serving up Sea Wolf’s bread in her restaurants for years and now, the brothers have their own bakery in Fremont. Seriously, it’s well-worth the $4. And don’t get me started on the whipped butter. Beyond all this, the real reason I keep coming back is that Chef Erickson’s food blows me away every time. Take the stand-out dish from this evening, for instance. It wasn’t the melt-in-your-mouth cod served with dashi, mushrooms and an egg yolk. It wasn’t the steamed clams with sweet pepper, onion, cilantro and gin. Although those were both incredible. Billy’s Tomatoes, peaches, basil. Arguably the simplest dish on the menu and yet, the one seared into my memory. The tomatoes were the sweetest and most flavorful I’ve ever had. (And I’ve accidentally bought a $7 heirloom tomato at the farmers market before). This was better. 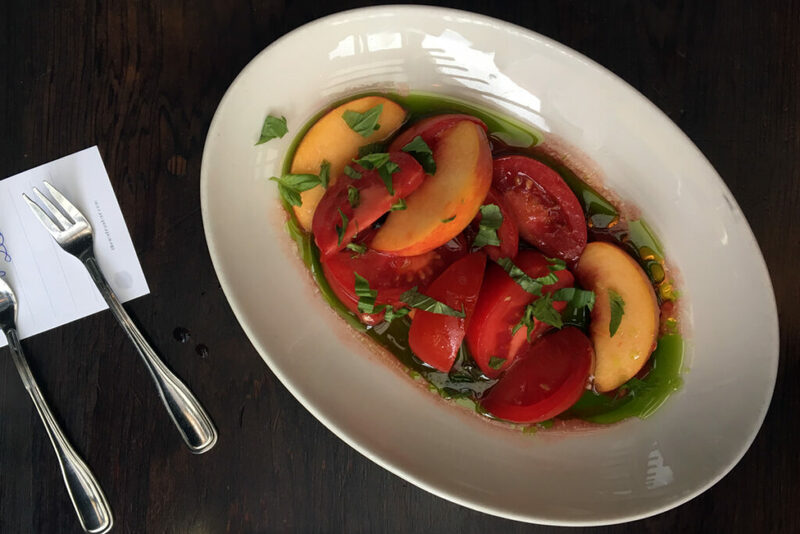 The basil and olive oil drizzled on top was the perfect subtle touch and united the peaches and tomatoes. I could have eaten the entire plate myself. And another one. Chef Erickson just seems to live and breathe the Pacific Northwest. She has a gift for selecting the freshest ingredients available and creating delicate, surprising dishes with them. 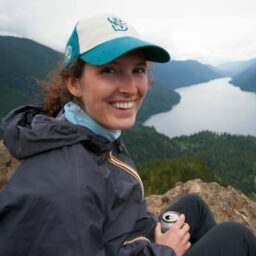 The ever-changing menu at Walrus is a testament to her skill as a chef and her love for this region. It’s what brings me back to her restaurants again and again. Well, that and the whipped butter. General Porpoise Doughnuts is located in Seattle’s Capitol Hill neighborhood at 1020 E Union St. 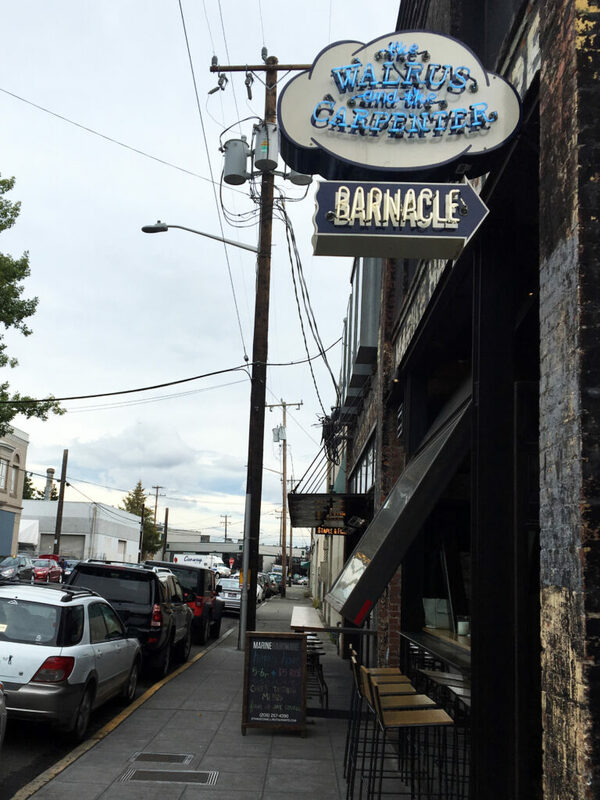 The Walrus and the Carpenter is located in Ballard at 4743 Ballard Ave NW. Learn more about all of Chef Erickson’s endeavors here.